With consumers projected to spend $7.33B online on Black Friday and Cyber Monday (NRF), retailers are in hot pursuit of anything that will help their marketing campaigns stand out from a very loud crowd. Imagine, last year 22,940 emails flooded inboxes on those two days alone, a 55% increase for Black Friday and 42% for Cyber Monday compared to the previous year. Maybe, just maybe, that “50% off everything” is no longer enough. Perhaps the free black tank top with purchase isn’t going to cut it. While consumers generally expect it from brands, the biggest shopping event of the year should not be the time to turn your brand into a used car salesman. It’s just not a good look. Perhaps one way to make a good impression is to get personal. Really personal. By personal, of course, we mean helpful, handy, and human. Persado, with a proven AI platform used by top retail brands, can help with the ‘human’ part because we help brands speak their consumers’ language. We help you speak with emotion. Across our campaigns, we’ve determined that emotional language on average accounts for as much as 60% of audience response. In most scenarios, emotional language sparks a connection better than the description of the product or offer or call to action. For situations like Black Friday, consumers are primed to scan for deals, but emotional language might give your brand a breakthrough moment in the inbox. 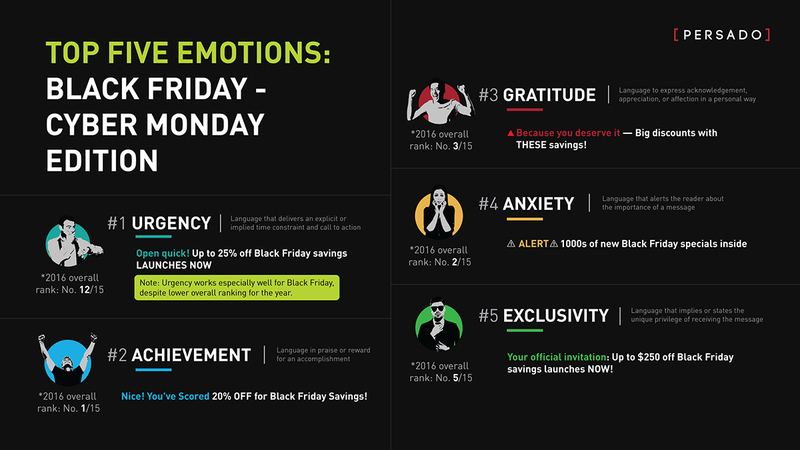 Using our platform, we analyzed retail marketing emails sent during the last week of November (encompassing everything from Thanksgiving to Black Friday to Small Business Saturday to Cyber Monday) and identified the top five emotions that won the inbox. While we recommend that marketers test the full gamut of marketing emotions, this set would be a great way to start.